It’s been a while since I’ve posted on here, but trust me, it’s been because I’ve been doing some really cool research that I can’t wait to post about once it’s farther along! Anyhow, I got an e-mail from a man named Peter a little while back about his infographic, and I just got a chance to give it a look today. It’s all about ramen, and I thought you all would like to see it too. I think the layout is fun, and I love to learn the history of things we tend to take for granted. It’s been a few years since I’ve eaten ramen, but there was a time when all I ate was stuff from the food bank, supplemented by ramen. I know a lot of us in libraryland run across infographics all the time, so I thought I would use this as a chance to open up a discussion about them too: what makes a good infographic (or a not-so-good one)? Do you find the content or the design of the graphic more heavily influences your opinion? 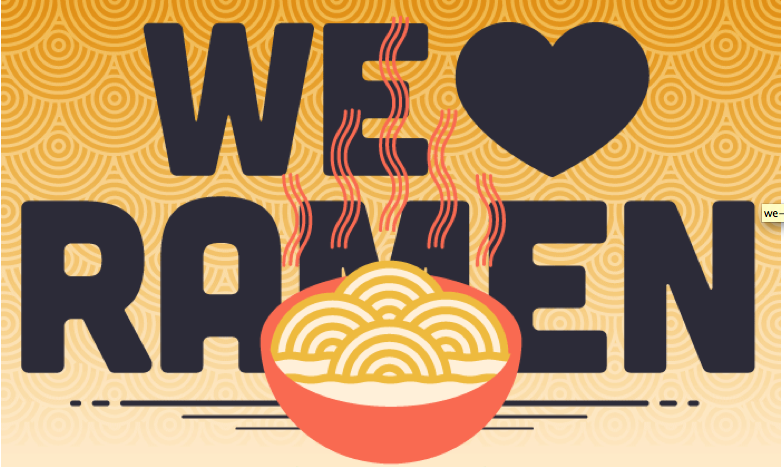 Here is the link to Peter’s ramen infographic (the whole thing is a little big to fit here, but I’ve dropped a screen shot of the title area below to entice you). I personally think it’s pretty good, but I am curious to hear what other folks think as well. I’ve found I’m very particular about setting when it comes to size, in that large poster-sized infographics fascinate me if they hang on the wall, but annoy me if they are online and I have to scroll all over them. I think one important aspect to a good infographic is the ability to take it in as a *whole*, then parse out the particulars. Something about the ability to conceptualize the “full story” of the infographic first is critical to how valuable I think it is. I agree–they are incredibly useful for getting a broad sense of something and to narrow down and look at particulars. I don’t mind having bigger infographics on a computer, so long as I can zoom in and out rather than spending 10 minutes scrolling! Previous PostPrevious LIS Professionals and Big-Time Publishers: Do We Speak Out?